Some good news for jazz fans and drummers traveling through New Orleans this winter. Below is some info from the New Orleans Jazz Museum website. New Exhibition at the Jazz Museum Celebrating the Development of the Drum Set and Evolution of Drumming Traditions in New Orleans opened on November 8, 2018 and runs through March 15, 2019. 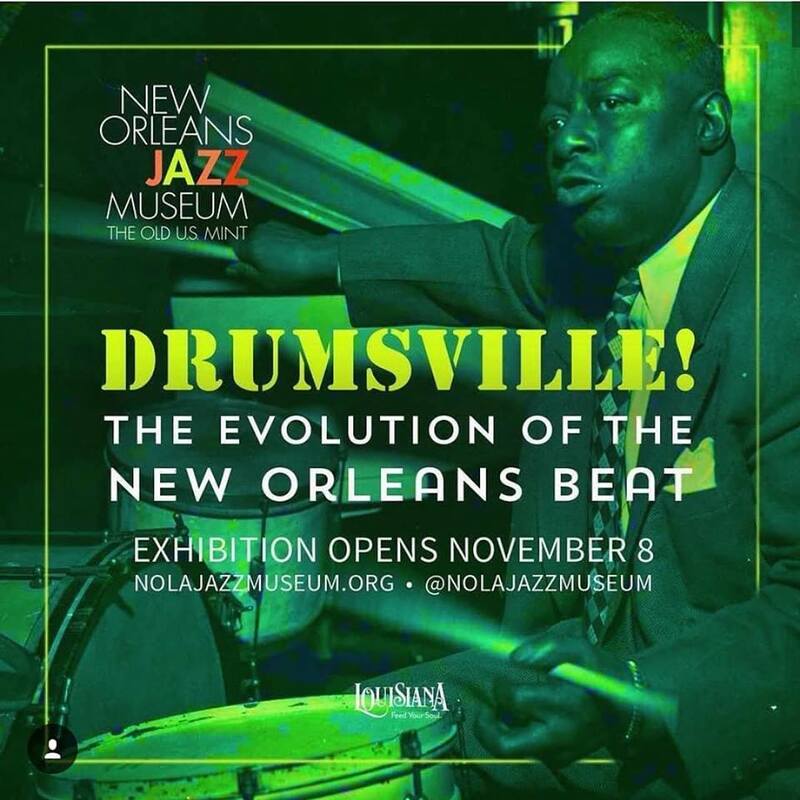 The New Orleans Jazz Museum will debuted a new exhibition, Drumsville! : Evolution of the New Orleans Beat on November 8, 2018. The exhibit will celebrate both the New Orleans Tricentennial and International Drum Month, along with the development of the drum kit in New Orleans and the ongoing evolution of rich local drumming traditions. Drumming reaches back to the eighteenth-century foundations of New Orleans—in terms of both the Africans who performed throughout the region, eventually organizing drum circles in Congo Square, and the European marching bands of the colonial militias, operas, concerts, and balls. Drumming plays a central role in the evolution of African American and local music traditions. Brass bands, which included multiple percussionists performing on bass and snare drums and cymbals, have flourished in the city throughout the eighteenth and nineteenth centuries to today. A crucial transition in the development of the drum kit was the development of the bass drum pedal, which enabled a single drummer to simultaneously perform on multiple drums and cymbals. One of the earliest bass pedals was used by New Orleans drummer Edward “Dee Dee” Chandler. The only extant photograph of Chandler, dated 1896, shows his rudimentary bass pedal in the lower left corner of a band portrait. “Drumsville! The Evolution of the New Orleans Beat coincides perfectly with the city’s Tricentennial,” added Robert H. Cataliotti, Music Critic and Guest Curator of Drumsville! “The exhibit traces the essential and innovative role that drumming has played from the Sunday gathering of people of African descent in nineteenth century Congo Square to today’s thriving music scene. In 1909, The Ludwig Company patented a bass drum pedal, and that, along with the invention of a snare drum stand, launched the development of the drum kit, perfectly in sync with the blossoming of jazz. New Orleans drummers were at the forefront in defining what it means to play this new, distinctively American, instrument. Probably the most renowned aspect of New Orleans rhythmic legacy is the “second line” rhythm that emerged from brass band parades. New Orleans drummers adapted this distinct rhythm to many musical contexts, including brass bands, traditional and modern jazz, rhythm and blues, rock and roll, and funk. The second line tradition continues to this day in the Crescent City. Drumsville! will begin with the legacy of Congo Square, including traditional African percussion instruments from the Southern University at New Orleans African Art Collection, and move through the brass band tradition to the introduction of the bass drum pedal and development of the drum kit and the extensive legacy of drummers to emerge in New Orleans over the past century. Drawing upon the Jazz Museum’s large and unique archive of historic instruments, drum kits and equipment will be featured from such New Orleans legends as Papa Jack Laine, Baby Dodds, Paul Barbarin, Louis Barbarin, Cie Frazier, Ray Bauduc, CoCoMo Joe Barthlemy, Earl Palmer, Idris Muhammad, Zigaboo Modeliste, and James Black. In addition, contemporary New Orleans drum masters Johnny Vidacovich, Herlin Riley, Shannon Powell, and Stanton Moore will generously equipment from their personal collections. Drumsville! will also examine related traditions of improvised percussion instruments and the tambourine, and conclude with the next generation of drummers, testifying to the vibrancy of the city’s drumming tradition. Drumsville! will be on display through March 15, 2019. Daily admission to the Jazz Museum is $6.00 for adults; $5.00 for students with I.D., senior citizens (65+) and members of the military. School groups meeting required criteria and children 6 and under are admitted free. Located at 400 Esplanade Avenue, New Orleans, Louisiana 70116 with an additional entrance at 401 Barracks Street, the Museum resides at the intersection of Esplanade and Decatur Streets in the French Quarter of New Orleans. The New Orleans Jazz Museum is a Louisiana State Museum. Founded in 1906, Louisiana State Museum is a system of National Historic Landmarks and architecturally significant structures housing a half-million artifacts that showcase the state’s history and culture. For more information, please call 504-568-2566 or visit www.nolajazzmuseum.org. UPDATED: See Marv’s obituary below. I was sad to learn of the passing of Marv Dahlgren last week. I was fortunate to see him last year in the audience for a jazz show by a couple of his former students, Phil Hey and Dave Hagedorn. They made a point of introducing him and the whole audience gave him a standing ovation. What can be said about his influence on the drumming community? Marv was a beloved percussion instructor who authored and co-authored many influential books on drumming including 4-Way Coordination, Accent on Accents, and Drumset Control. Many of Marv’s out of print books can be found at Really Good Music. Marv was the former principal percussionist and assistant timpanist for the Minnesota Orchestra. In addition to the albums he has made with the orchestra, Marv has also recorded with Cat Stevens and Leo Kottke and has performed on many jingles. Marv was also known as an excellent mallet player and performed on vibes with his own jazz group in venues around the Twin Cities. Marv taught at the U of MN for 35 years; St. Olaf College for 20 years; McNally -Smith College for 26 years and Augsburg College for 9 years. He has performed as a soloist with the MN Orch and played with many of the legends of Jazz including Oscar Peterson and Doc Severinsen. Here is Leigh Kamman interviewing Marv in January 2001. Dahlgren, Marvin D. Age 93, lifelong resident of the Twin Cities, passed away at his Roseville home on Friday, April 6, 2018 while in hospice care. Remaining independent almost to the end, his was a life lived to the fullest. He will be greatly missed. Marv leaves a legacy of achievements that is hard to sum up in a few words. He was an iconic figure in the local and national music scene, both as a consummate orchestral and jazz performer and as a teacher and clinician. His career included a nearly 50-year tenure as principal percussionist and assistant timpanist with the Minnesota Orchestra, teaching positions at various universities, and appearances as a drummer and vibraphonist with local and national jazz greats. He was a soloist with the Minnesota Orchestra and the Dallas Symphony, and has many recordings to his credit. Marv was also the owner of a drum shop, author of numerous well-known drum method books, and composer of jazz tunes. In addition to his musical activities, Marv spent 20 years in the Navy, first in active duty as a Corsair fighter pilot during WWII and later in the Navy Reserve. Flying remained his passion even after he retired as lieutenant, and he went on to teach acrobatic flying in his spare time. Marv touched the lives of countless people, not only through his many talents but also with his engaging personality and pleasant demeanor. There was always a twinkle in his eye, a story to be recounted, and a joke to be told. He had a generous spirit, giving freely to multiple charities and chairing and/or organizing hunger relief benefit projects. Marv was preceded in death by his parents, Henry and Ida Dahlgren, sisters Lorraine (Lilja) and Eileen (Ctibor), his wife Joan, and his stepson John Stieger. He is survived by his former wife Betty, son Todd (Chris), daughters Lisa (David Maguire) Dahlgren and Lynn (Nicholas) Fergusson, stepson Tom Stieger, stepdaughters Connie Stieger and Mary (Brian) Feist, eight grandchildren, two great-grandchildren, and multiple nieces and nephews. A musical Celebration of Life is planned for Sunday, June 17 from 1-5pm at the MacPhail Center for Music, 501 S. 2nd Street, Minneapolis. His final resting place will be at Fort Snelling in honor of his military service. In lieu of flowers, memorials are preferred to one of the following organizations: Second Harvest Heartland, MacPhail Center for Music, American Heart Association.